This has to be one of my favourite meals. Light and nourishing yet still tasty and comforting enough to feel like a real treat. The recipe is really flexible too, so feel free to chop and change ingredients as you go if you want to. 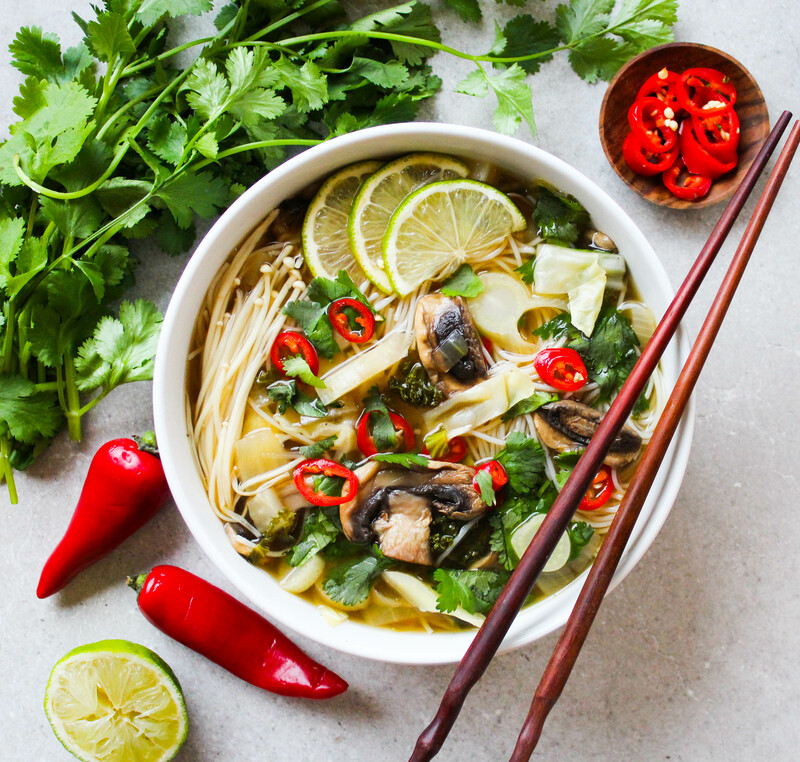 The only essentials really are the noodles, some stock and the chili, coriander and lime. I don’t think I’ve ever made the same bowl of pho once and that’s part of its beauty. If you’d like to recreate this exact bowl, read on for the recipe. Heat your coconut oil in a medium sized saucepan. Lightly fry your onion, cabbage, fennel, kale stems (save the kale leaves for adding at the end) and mushrooms. Fry for 5-7 minutes until soft. Set aside in a bowl. To the empty pan, add your ginger, garlic, cinnamon, star anise, miso, rice wine vinegar and maple syrup. Add about four cups of water and bring to a gentle simmer for 15-20 minutes. While all those delicious flavours are developing in your stock, make your noodles. After 15-20 minutes, strain your stock using a sieve. Add the stock back to the pan with the fried veggies and noodles. Add in kale leaves and cook briefly until wilted. Garnish with fresh chili, lots of a coriander and a big ol’ squeeze of lime. Thank you for this recipe, I am making this again for the second time this week! It was better than any pho I’ve ever had dinning out! I’ve also forwarded it on to a few friends. I wish you had a Pinterest share button on your site so I could pin your recipes… I wasn’t able to with just the link for some reason.